And since my latest and very expected cookbook purchase hasn’t arrived yet I had to bake from another one of Ms. Medrich’s fabulous books – these biscotti turned out so good, so delicious, that it was hard photographing them before eating the whole batch. Preheat the oven to 150°C/300°F. Position a rack in the middle of the oven and line a large baking sheet with baking paper. Combine the flour, sugar, baking powder, and salt in a medium bowl and mix together thoroughly with a whisk or fork. Set aside. Whisk the eggs, amaretto and vanilla in a large bowl until well blended. Stir in the flour mixture and then the almonds. The dough will be thick and sticky. Scrape the dough into a long log shape lengthwise on the cookie sheet. Wet your hands and shape the dough into a long flat loaf about 30x10cm (12x4in). Bake until firm and dry, about 50 minutes. Remove from the oven and let cool for about 10 minutes. Line the cooled cookie sheet with baking paper again. Carefully remove the baking paper from the loaf and transfer it carefully to a cutting board. Using a long serrated knife, cut the loaf on the diagonal into slices 1.25 to 2cm (½ to ¾in) wide. Lay the slices, cut side down, on the cookie sheet. 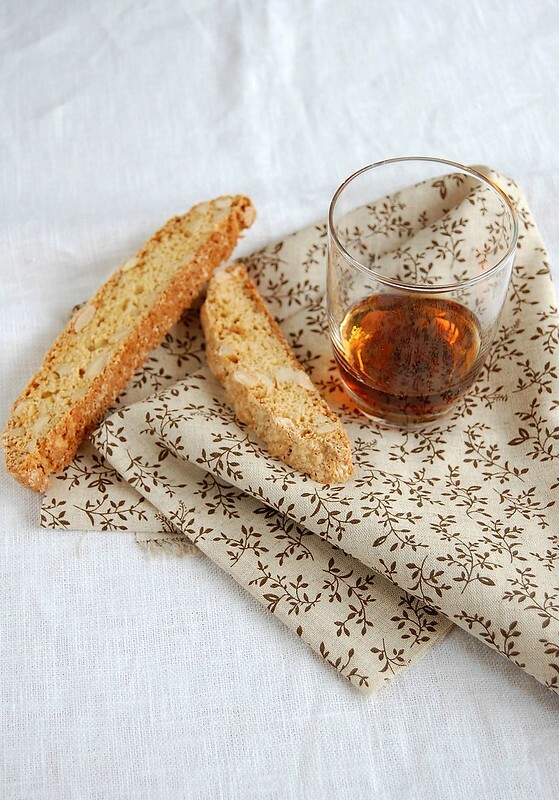 Toast the biscotti for 40-50 minutes or until the cookies are golden brown. Place the cookie sheet on a rack to cool. Cool the cookies completely before stacking or storing. May be stored, airtight, for several weeks. Thank you for sharing this recipe and the lovely photos. Skyfall looks pretty dramatic. How can you not love Judy Dench? And the cookies? they look wonderful.